GLOBAL AWARENESS 101 - Let your VOICE be heard and get involved. OUR future depends on it! : NIGERIA: Two Female Islamist Suicide Bombers Wearing Burkas Tried To Enter A Christian Church Service. Both Muslims Were Stopped, And Then Detonated The Bombs Outside The Church. NIGERIA: Two Female Islamist Suicide Bombers Wearing Burkas Tried To Enter A Christian Church Service. Both Muslims Were Stopped, And Then Detonated The Bombs Outside The Church. This week two female Islamist suicide bombers wearing burkas tried to enter a Christian Church service in Nigeria. Both Muslims were stopped, and then detonated the bombs outside the church. Nigeria – Boko Haram Suicide bombers tried to enter a Catholic Church service on Sunday, March 10 in Madagali, Adamawa State. The two bombers, who were women, tried to enter the church through a clinic before being stopped, and then detonating the bombs a short distance outside the church. Despite the two bombs going off, only one person other than the bombers was reportedly injured. Thankfully, according to local sources, some of the local youth were on patrol around the church when the attackers arrived. They were able to stop them from entering the Church. This was the reason that none of the suspected targets were injured or killed. It is very likely that the two bombers were captives of Boko Haram who were forced to commit this attack. Boko Haram is known for kidnapping women and children and forcing them to act as suicide bombers for their attacks. In 2017, between January and August, UNICEF reported on at least 83 children having been used by the group as suicide bombers. This tactic is one of the reasons that Boko Haram is considered in the top three deadliest terrorist groups in the world. As Boko Haram continues to regain strength and support, Christians are likely to become a main target again, as they were in the early years of the group. 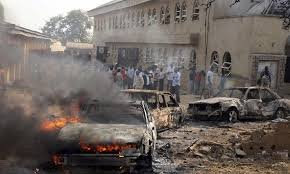 ADAMAWA STATE, NIGERIA (ANS) — Two suicide bombers who targeted St. Pious Catholic Church in Shuwa, Madagali Local Government Area of Adamawa State, detonated their bombs, killing only themselves, SaharaReporters http://saharareporters.com reported. “Vigilant Catholic cadet boys on patrol around the church vicinity prevented the bombers from gaining entry into the church, thereby forcing the explosives to detonate before getting to their target,” the eyewitness said, just as he confirmed that only the two bombers were killed in the incident. Most Reverend Stephen Dami Mamza, Catholic Bishop of Yola Diocese, confirmed the attack to SaharaReporters. “Catholic cadets stopped them at the main entrance. The bombers arrived 30 minutes into the mass which started around 6am. When they could not access the church, they detonated, but thank God none of the cadets were hurt. Only a grandmother and her grandson were shocked by the loud bang, but they have since left the hospital,” he said. Mamza, who doubles as Chairman of the Christian Association of Nigeria (CAN), Adamawa State chapter, further said armed military personnel were drafted to the scene within minutes of the attack and have since cordoned off the area to recover possible unexploded devices. Shuwa village, which is about 30 minutes drive to the Sambisa stronghold of the outlawed Boko Haram sect, has witnessed series of Boko Haram incursions in recent times. Ahmed Umar Fintiri, the candidate of the opposition Peoples Democratic Party (PDP), who is widely speculated to clinch the keenly contested governorship election is from the area. Meanwhile, results of the governorship and assembly elections have just started trickling in at the headquarters of the Independent National Electoral Commission (INEC) in the state. The British High Commission in Nigeria has expressed concerns over the report of military interference in the election in Rivers State, according to Premium Times www.premiumtimesng.com . The commission was reacting to reports from its election observers about the tension at the collation centre in Port Harcourt. It said the military interference in the polls is putting stress on the staff of the Independent National Electoral Commission and has made it difficult for them to carry out their duties. There has been a heavy presence of the military in River State, which has been rocked with election violence since the presidential polls.